With a generous sign-up bonus, the United Explorer Card makes it easy to earn a free flight quickly; but you’ll have to fly United often to make up for the card’s $95 annual fee. The United Explorer Card has undergone some major updates in 2018. And – aside from the removal of its price and return protections and reduction of its trip cancellation coverage to $1,500 per year – the news is good for current and prospective cardholders. With 2x miles on hotel and restaurant purchases, cardholders now get a much better earning rate with the Explorer card. Plus, Chase has tacked on a $100 credit for Global Entry or TSA Precheck and a 25-percent bonus for in-flight purchases to the card. The United Explorer gives you a little more mileage than your typical airline card. In addition to the 2 miles per dollar that you earn for tickets purchased directly from United, you earn 2 miles per dollar on restaurant and hotel purchases – making the card a good companion on your travels – and 1 mile per dollar for everything else. United allows you to redeem miles on one-way or round-trip travel. You can also redeem miles for other travel expenses, such as hotel rooms, cruises or car rentals. The $95 annual fee is slightly higher than what you will pay for most other travel cards. But if you are a loyal United customer, the card might pay for itself with just a couple of uses. At the minimum, you get a decent sign-up bonus and up to two free bags for you and a companion. Note, Chase recently updated the card to waive the fee for the first year. If you are unsure about keeping the card, you can give it a trial run and cancel before the year is up to avoid the fee altogether. You can receive a fair-sized sign-up bonus of 40,000 miles after spending $2,000 in the first three months. Plus, for a limited time, you can receive and additional 20,000 miles if you spend $8,000 in the first six months – for up to 60,000 miles total. These miles can take you far on United, if you redeem them for a Saver Award – we estimate that the bonus is worth around $900 in airfare. You can also earn additional miles with dozens of United partners, such as hotels, car rentals and many more. United Airlines offers one of the more flexible booking policies for an airline rewards program. The United website has a user-friendly mile-redemption interface, and availability is generally not bad in the economy seating section, except for prime travel time. In addition, United is a member airline of the Star Alliance, which is the biggest airline alliance in the world. So, you can use United miles to book an award seat on 39 partner airlines. There are some quirks, however. First, not all partner-airline award tickets can be booked online. Second, United only shows the lowest award rate, which doesn’t tell you if this is the best (“Saver”) award rate to your destination. Use this interactive award chart to know exactly what you are getting and consider changing travel dates if the rate is not the best. If you don’t care which airline you fly on, you may be better off with a general reward credit card that allows you to choose any airline. According to Holly Johnson at The Simple Dollar, the Chase Sapphire Preferred Card is a great for more than just United flights. The United Explorer Card offers primary rental coverage in the U.S. (Coverage is always primary outside of the U.S.). Usually, credit cards only offer secondary coverage, which means you have to turn to your own car insurance company first if you have a loss while driving the rental car. Primary coverage means you won’t have to deal with your own car insurance in case of damage or theft. The card offers some valuable benefits for United Airlines passengers, such as a free checked bag for yourself and a companion traveling on the same reservation and a 25-percent bonus for in-flight purchases on United (including Wi-Fi). Note that you must buy your ticket with the United Explorer Card to be eligible for these benefits. You also get two free one-time-use passes to be used at any United Club airport lounge in the world on an annual basis, and priority boarding for yourself and your companion. Domestic United Club lounges offer comfortable seating, free coffee, soft drinks, snacks and Wi-Fi. International United lounges add free alcoholic beverages and more eating options to the list. Also, as mentioned, the card offers $100 for Global Entry or TSA Precheck. Why get the United Explorer Card? You use United for most of your travel. You want to maximize mileage earnings. You want to save money on checked bags. You value other perks and Visa Signature benefits of the card. 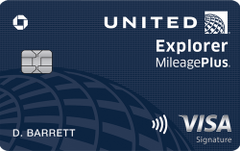 Always make United ticket purchases with the United Explorer Card for 2 miles per dollar. Try to redeem award seats at the Saver level. If you book a round-trip award, you can add a free stopover along the way. Consider using United miles on United partner airlines, which can be a better value. When you rent a car in the U.S., always pay with the United Explorer Card to take advantage of its primary rental coverage.